Of all metal subgenres, black metal has the easiest time with coming off as straight up evil. Death and thrash are violent; heavy metal can deal with evil subject matter, as can doom; power metal..well we’ll leave those folks out of this. But black metal, in terms of sonics, lyrics, and general attitude, is the subgenre I most associate with the malevolent. 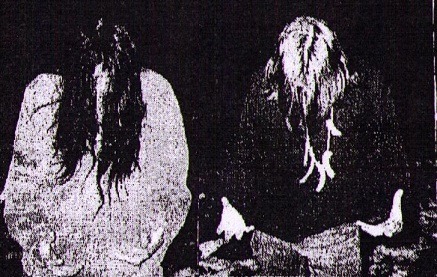 Within black metal, there are some bands who play a style that takes evil to the furthest reaches. 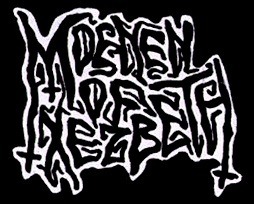 Moanen of Xezbeth are one of those bands. This is a grimy, bottom-feeding swirl of muck straight out of hellfire’s pitch. Primordial filth in the vein of early Samael. And they play the part very well. The production is pretty lofi, with very trebly, buzzy guitars and bare-bones sounding drums. Vocals are mixed at just about the same level as the other instruments, allowing us to hear the unhallowed shrieks very clearly. The vocals are really nasty as hell—hateful, venomous, and terrifying. Keys kind of dance around in the mix. In some songs, they’re a focal point and they’re just as noticeable as the guitars, but in others they are used as more of an atmospheric touch. Another atmospheric touch present throughout the album are the BELL SAMPLES. Many samples have bells being rung in the background which could come off as cheesy but doesn’t, rather coming across as ominous and occult. Speaking of the occult, these songs really sound like they are the soundtrack to a horrifying ceremony that would likely involve a goat, a virgin, and copious amount of blood (along with the required druid hoods and tiki torches). The songs span in length from 1:00 to 8:00 minutes, but each of the shorter tracks are mood pieces (an intro and an interlude). All of the main songs on the album are lengthy, none being shorter than 5:00 minutes. MOX uses these long running times to create hypnotic, midpaced love-letters to the occult. The riffing is rather simple throughout, utilizing slow chords to create a chant-like atmosphere. The drums keep it simple as well, usually just keeping the pace and not doing anything too flashy. There isn’t a ton of movement in each song in terms of different riffs and sections, but one riff will be mutilated and reformed several times to fit different sections of the song. You might hear a riff played very slowly to start a song, then it’s played tremolo picked in a speedier section, then there’s an in between section that warps the riff even further. Despite their bare-bones approach, the album almost never feels like it is dragging. There are a couple of tracks where the outros begin to wear thin by the end, but that’s a minor complaint given the song lengths. Despite the album’s focus on slow to mid-paced tempo, the most compelling moments may be when things speed up. By the time a speedier part comes around, you find yourself so used to the slow paced that it’s a real punch in the jaw and comes off as absolutely thrilling. “Oath of Malignancy” and “Ancient Spells of Darkness” utilize this technique to great effect, and as a result are probably the best songs on the album. All of these aspects come together to create a very coherent picture of darkness, magick, and hell. Certain folks may find themselves wanting more jivin’ and shakin’ while listening to MOX, since the riffs tend to repeat themselves a lot. But I find that it creates a ritualistic march toward the abyss that goes toe to toe with any other old school black metal album released this year. The only knock on the album is that the songs can tend to get a bit draggy, but I didn’t find myself feeling that way very often. “Obscured by Lunar Rites” may be the worst offender here with the longest run time and a 3:00 outro, but it feels appropriate to have a long outro on the final track as well. Also the outro is a twin guitar fuzzfuck with amazing tribal drum pummeling behind it, so 3:00 of it can be forgiven. Also, “Obscured…” gets away with it because the rest of the track is just straight awesome, with one of the most kinetic and engaging intros across the album. So basically who cares about the long outros is my point. This album will transport you back to the olden days of black metal, when things like “talent” were superfluous to creating great BM albums. What we’ve got here is a commitment to solid riffage, great atmosphere building, and ritualistic sensibilities that create an excellent blackened mess. 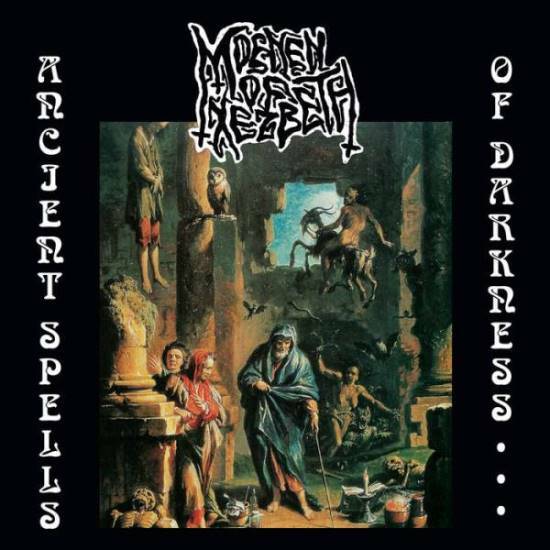 This entry was posted in Black Metal, Reviews and tagged Ancient spells of darkness, Belgium, black metal, Lofi, Moenen of Xezbeth, old school, Perverted Ceremony, Samael.